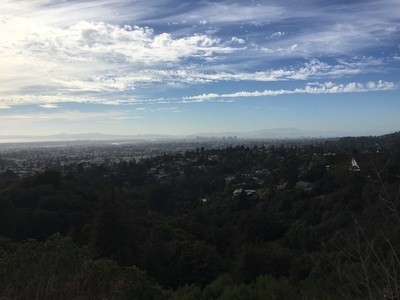 Address: 4432 Mountain blvd, Oakland, CA (approx.) 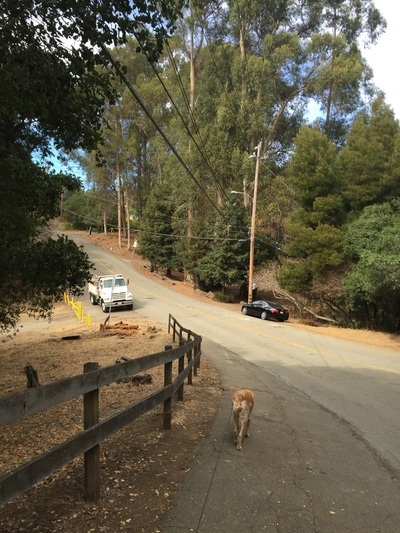 Trailhead is next to Leona Lodge - see below. Parking: Free parking available in the surrounding neighborhood; please be respectful of residents. 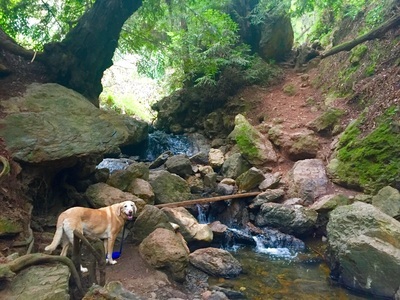 CAUTION: Do not let your dog drink from the creek, as it may be contaminated. 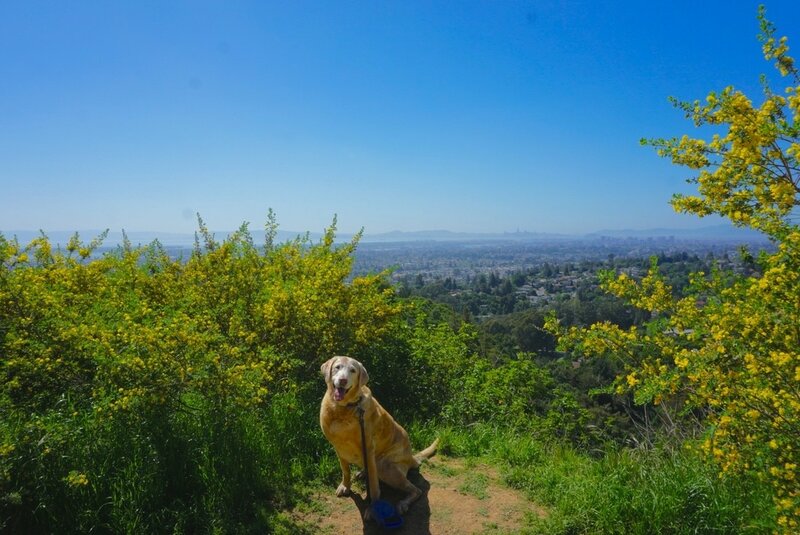 Description: This hike (not to be confused with Leona Canyon) is one of my favorites of all time because it has all of my favorite features: it’s not crowded, it has beautiful shaded trails following alongside a creek, interesting structures that blend well with the trail, and views of the bay. This is also a relatively short hike, and although parts are challenging, you’ll be able to experience a few changes in scenery in a short time. 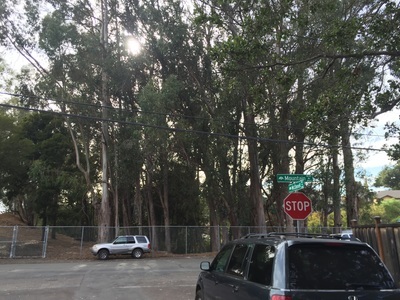 If you didn’t know this park was here, you probably wouldn’t find it, because the trailhead is not viewable from the street. 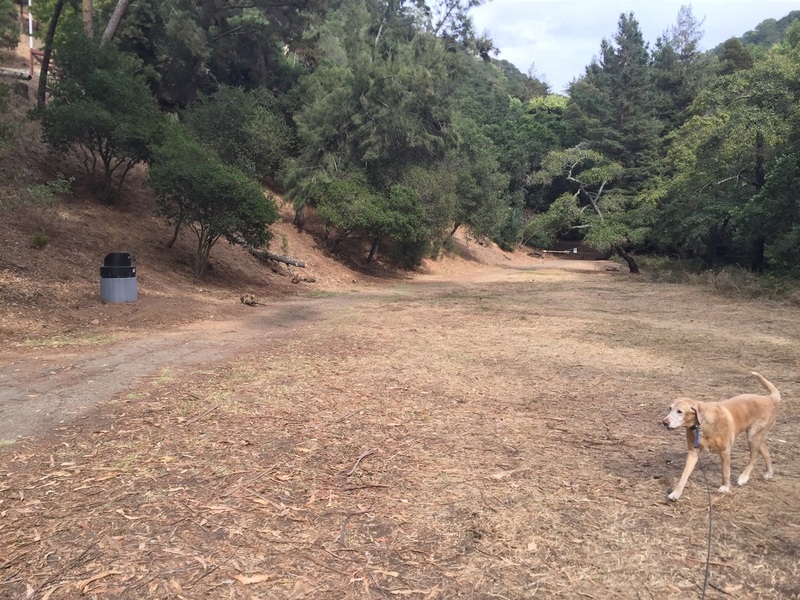 Right next to Leona Lodge you will see an empty lot with a white “welcome” sign and a garbage can further down. 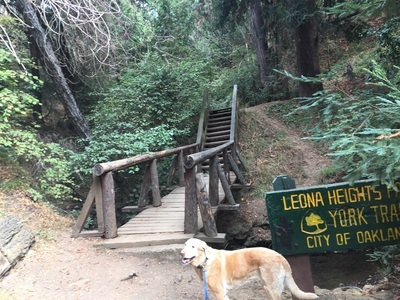 Keep walking and you will see the “Leona Heights Park, York Trail” sign. 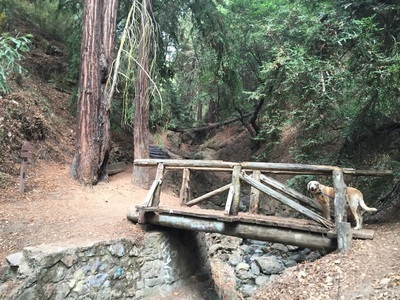 You will cross a wooden bridge (replaced May 2017! ), walk up some stairs, and cross two more bridges. 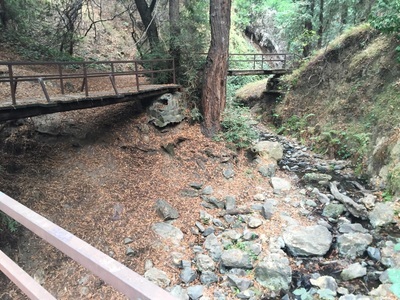 At this point you already have great views of the creek below. After walking up some stairs constructed from logs and crossing another bridge you will come to a brown sign that says “Crews Trail Maint.” If you go left, it will take you up some steep switchbacks leading to the Merritt College parking lot. 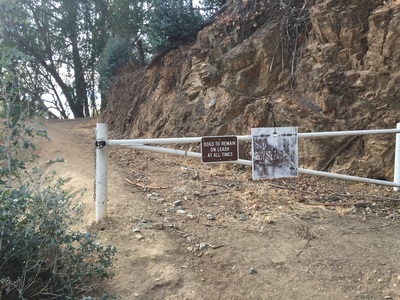 You can even cross the parking lot and continue your hike into a different park, Leona Canyon. However, I prefer to take the trail to the right of the "Crews Trail Maint" sign, and you will continue alongside the creek via McDonnell Trail. Soon you will come to a bridge simply made from a board, which will be tricky for your dog to use. 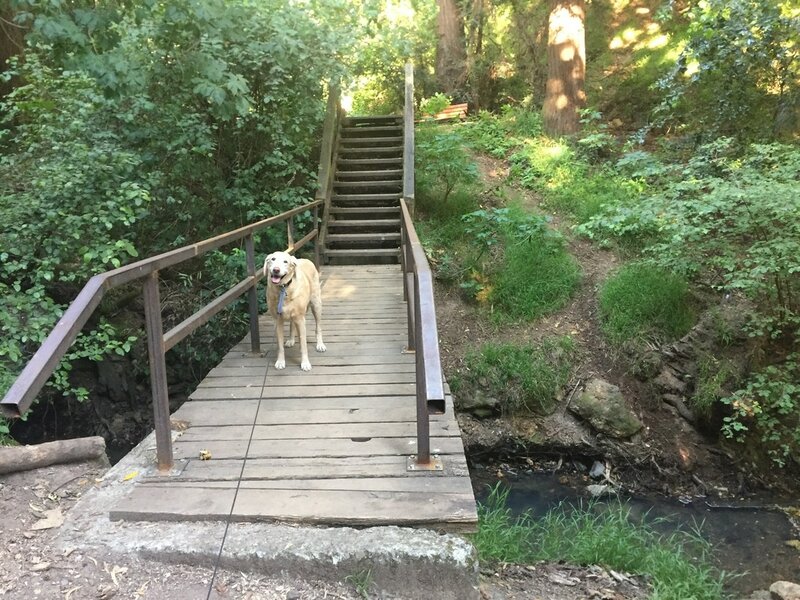 As long as the creek isn’t in full force, your dog should be able to walk across a short shallow stretch of the creek below. 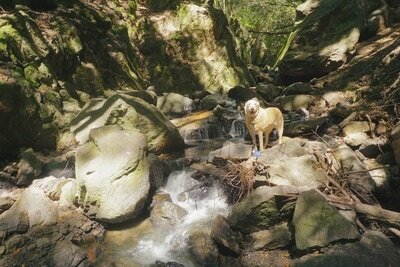 From here, you have to scramble up some rocks, and under and over a few fallen trees. 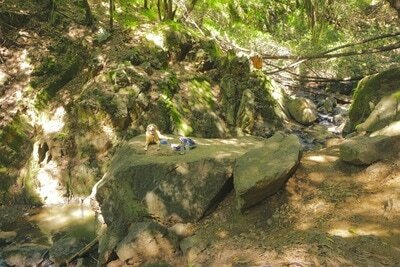 There are several large, flat boulders here, which make a great spot to stop for a break. 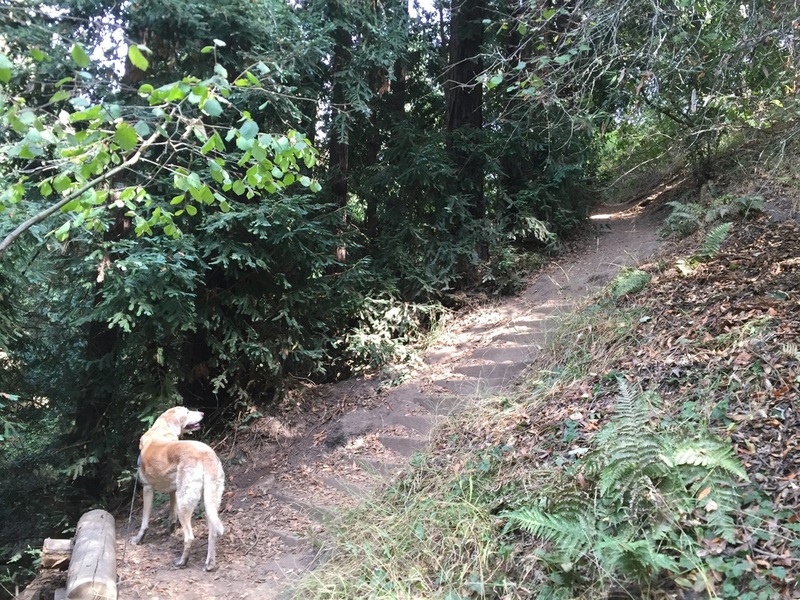 Soon you will be heading up some stairs and this trail will end at a flat, wide fire trail. Go right and head downhill. 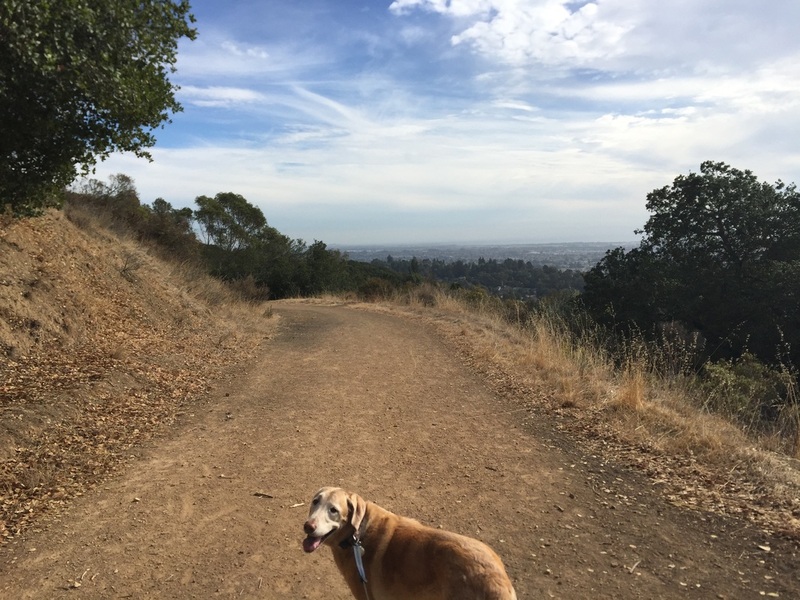 The trail opens up briefly to some great views of the bay. Then the trail snakes down and around the hillside with several switchbacks. Stay on the main wide trail and don’t take any of the smaller side trails. You will soon see some houses and come to a white gate leading to the street. Walk down the street (McDonnell Ave), and you will end at the intersection of Mountain Blvd and McDonnell Ave. Turn right and you will be back to where you started in three blocks. 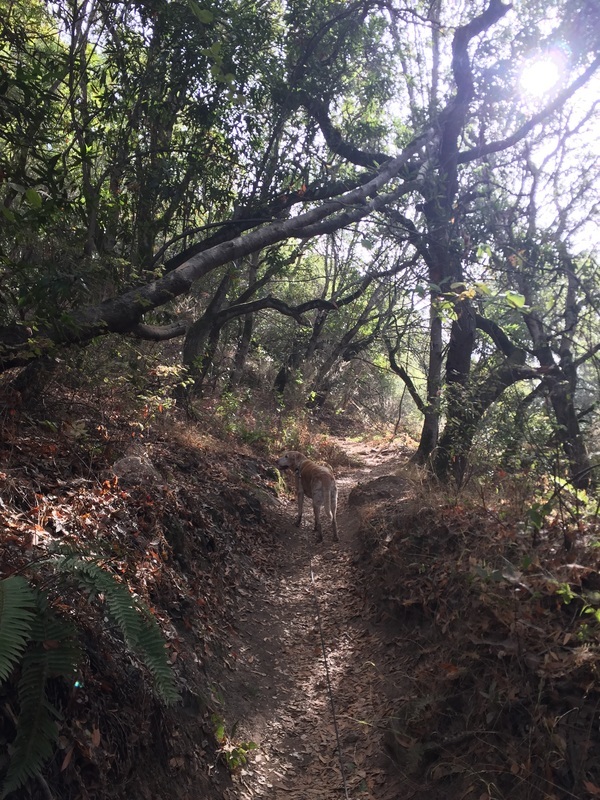 This hike takes about an hour and the end is all downhill. You can also take an alternate route, which will end at the fire road on Mountain Blvd. next to Belfast Ave. that has a yellow gate at the entrance. 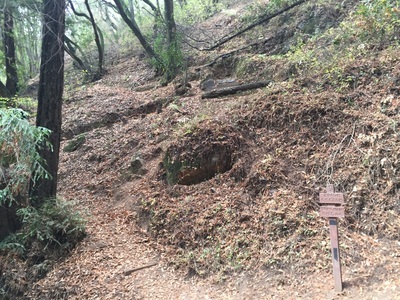 This trail is a little hard to find, and difficult to describe since there are no signs and during certain times of the year, the side trails may become overgrown. 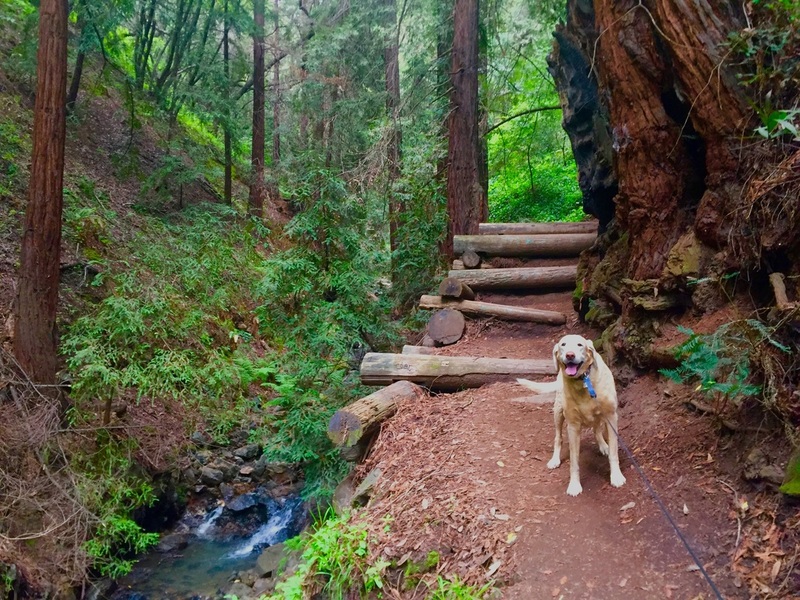 You will follow the same hiking directions above, hiking above the creek to the wide fire trail and up to the point of seeing views of the bay. 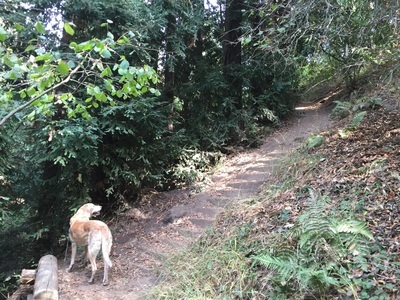 On your way downhill, you will take the first small side trail to the right. 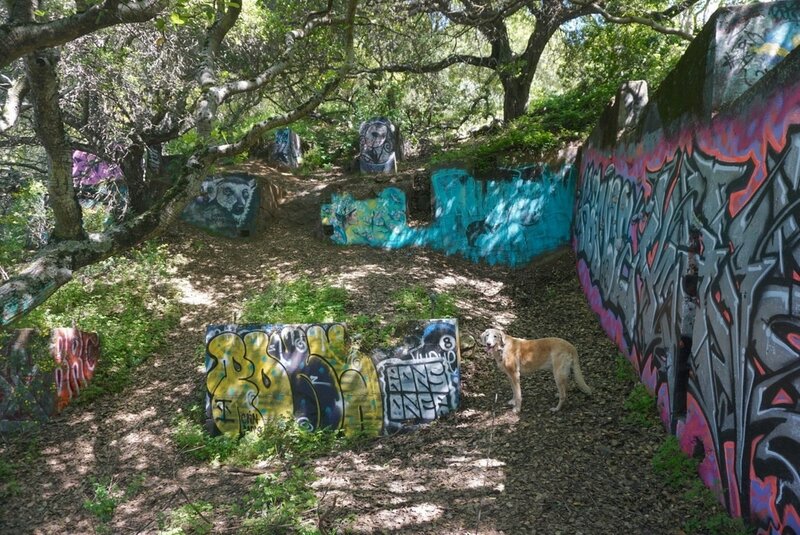 This quickly leads to a flat open space with some concrete remnants of a building, now decorated with beautiful street art, and even a small rock climbing wall. 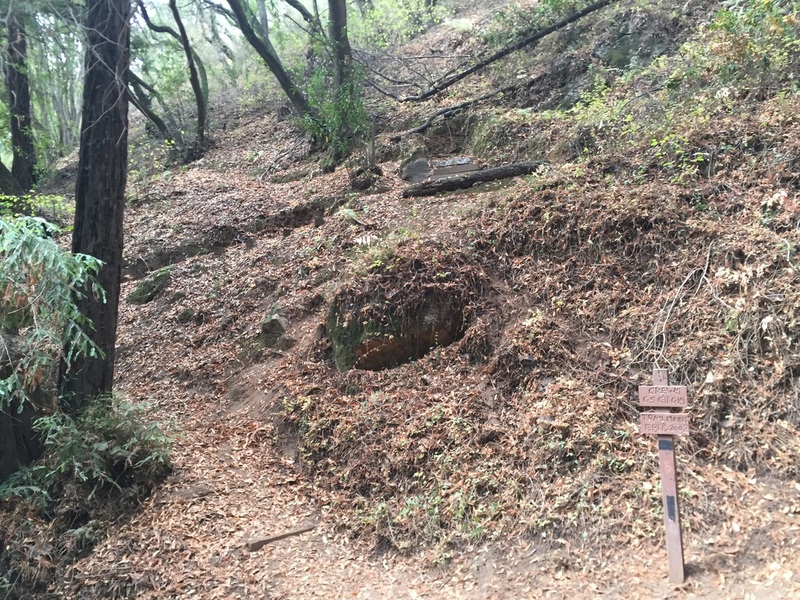 If you can't find this within a couple minutes, I would recommend retracing your steps back to the wide trail and following the previously mentioned directions so you don't get lost. 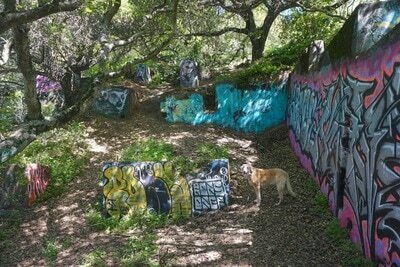 However, if you've found the concrete remnants I would recommend pulling up Google Maps for the remainder of the hike. Make sure you're heading towards Mountain Blvd below you as you hike down. 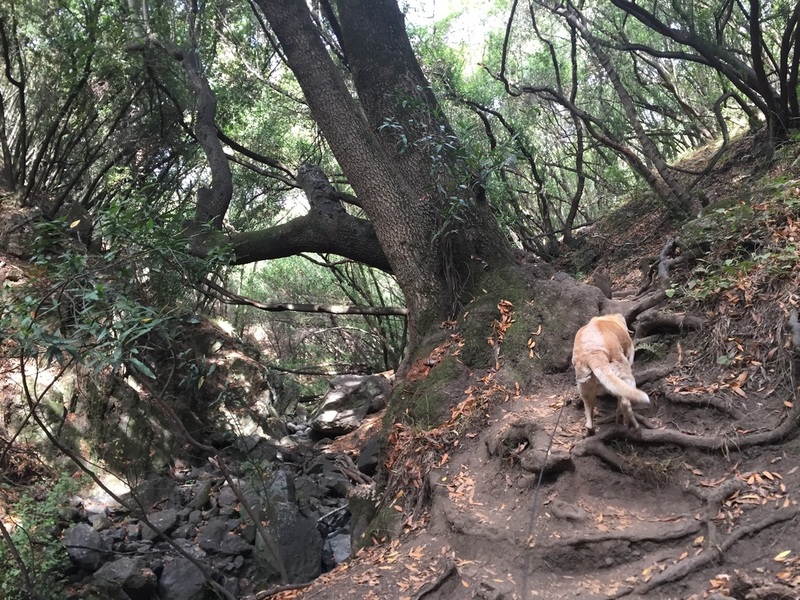 You will follow a narrow trail down, which has a couple bends and a steep scramble that you will have to be very careful going down. The last stretch is one more steep scramble which will lead you down to a wide fire trail. 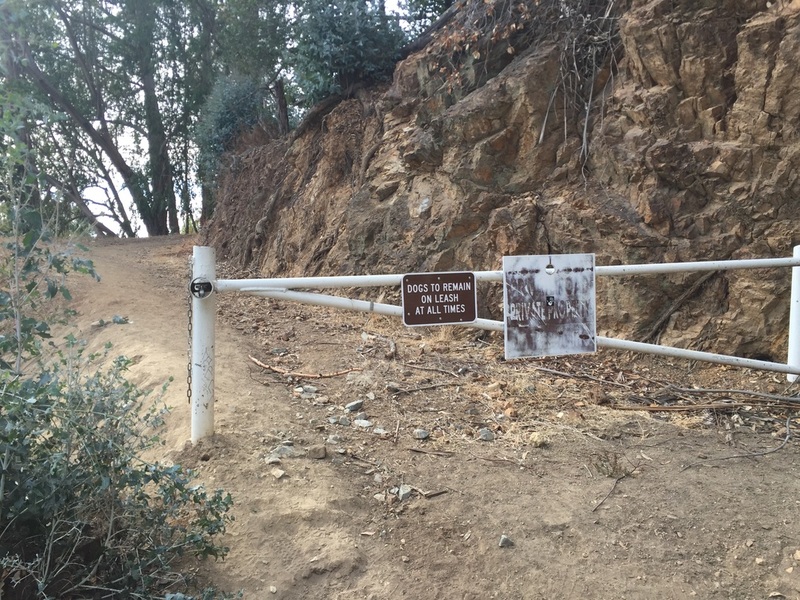 If you make a right on this fire trail you will soon see the yellow gate on Mountain Blvd next to Belfast Ave.
For a longer hike, you can take the trail up the Merritt Parking lot, which ends in a little under 1 mile. Cross the parking lot and you can hike down into Leona Canyon Open Space. 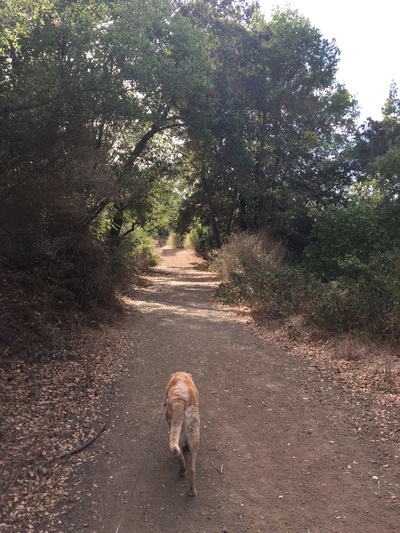 The main trail through Leona Canyon will add approximately 2.5 miles out and back to your hike, for approximately a 4.5 mile total hike. WARNING: Keep your dog from drinking the water in the creek. 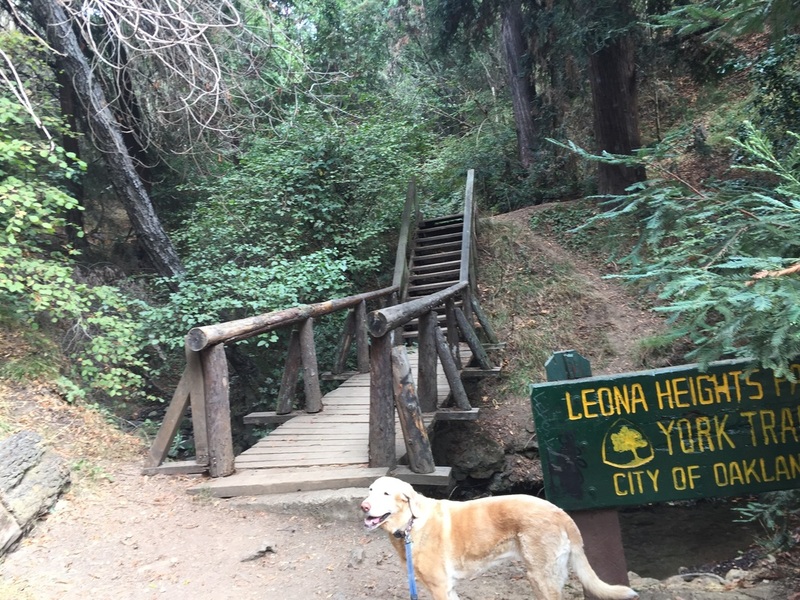 I've been hiking this trail for years, and I remember always seeing signs warning that the water may be contaminated from the nearby Leona Heights Sulfur Mine. Last time I hiked it, I did not see the warning sign, but I still wouldn't take the chance. 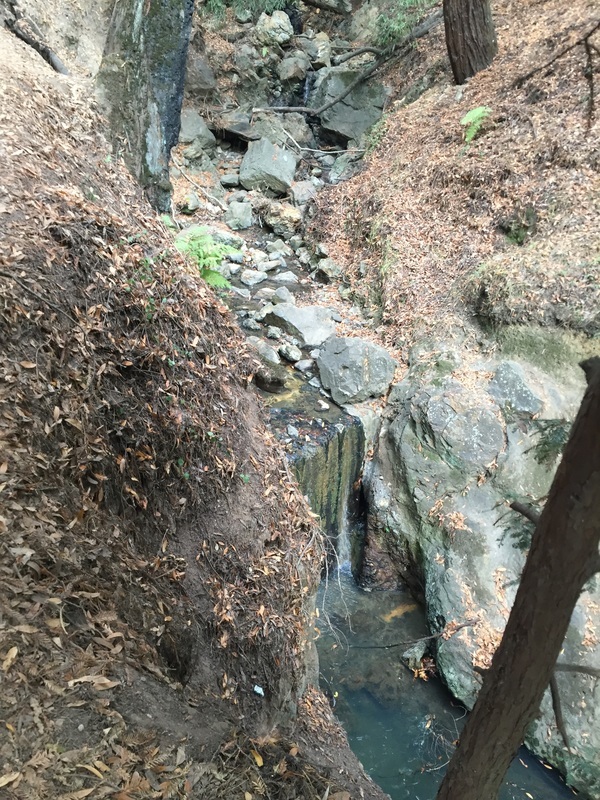 There still may be runoff into Leona Creek. 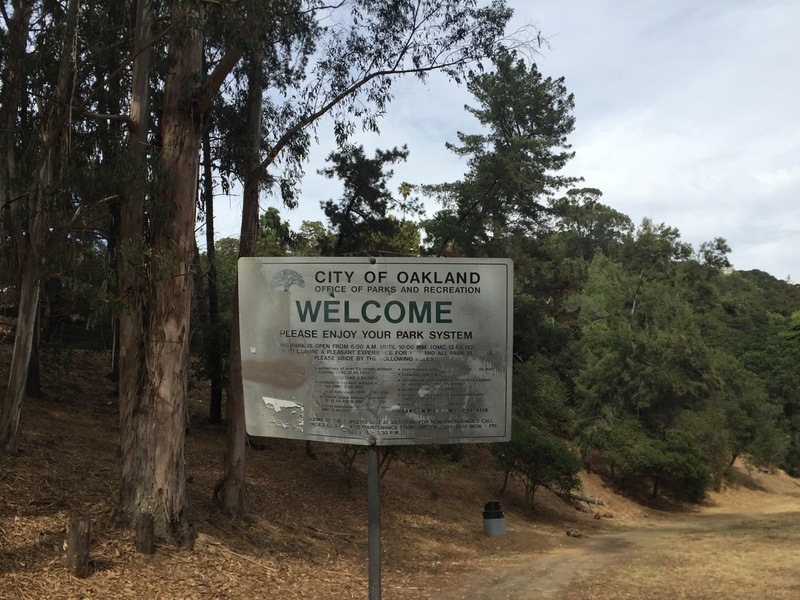 This park does not have restrooms or faucets, so bring plenty of water. 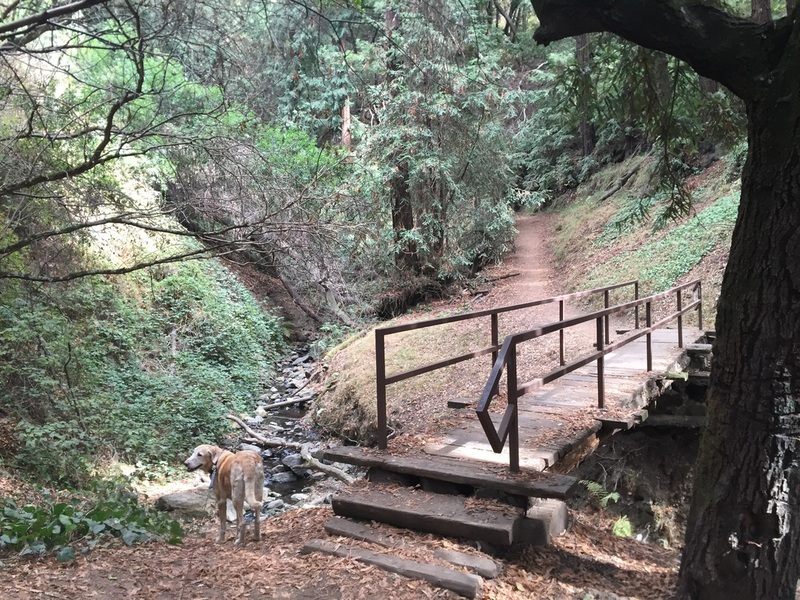 This fern-lined trail runs along the creek and up to an open fire road with stunning views of the bay area. This hike can be made shorter, and you can keep it almost entirely shady, but it requires a couple difficult scrambles down very steep, unmarked trails which are difficult to find. I kept this loop on the main trails, because the route is easier to find. 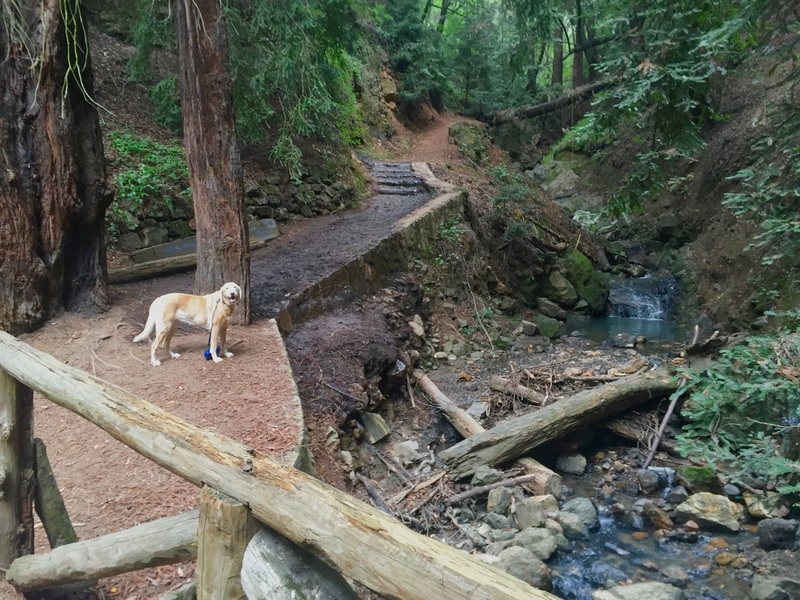 Unfortunately this park has very few trail markings and lots of small side trails. For our hike, we started at the entrance off of Mountain Blvd, and hiked up the creek via a series of wooden bridges. Stay on the main trail and cross the bridges; do not take any of the skinny side trails up to the right or left. You will come to a wooden plank crossing the creek in about a half mile. Cross the plank and you'll have to make a short scramble up between the boulders. This will continue snaking up along the creek. 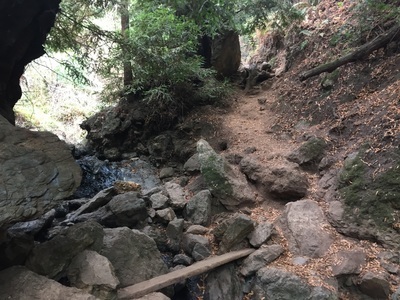 The trail will split after passing a series of boulders. Take the split to your right, which takes you up a a set of wooden stairs and onto a wide open fire road. 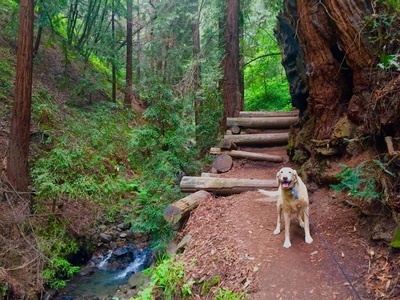 Go right, heading downhill, on the fire road. Soon after, at about a mile in, the trail opens up and some of the shade disappears. 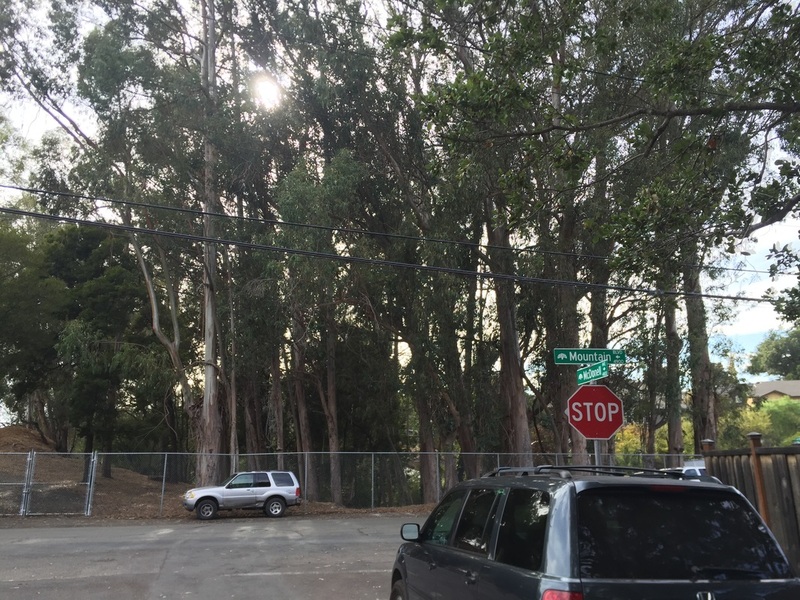 You'll soon see a glimpse of bay views to your right. Continue down the main, wide dirt trail. Do not take the splits to the right or left. 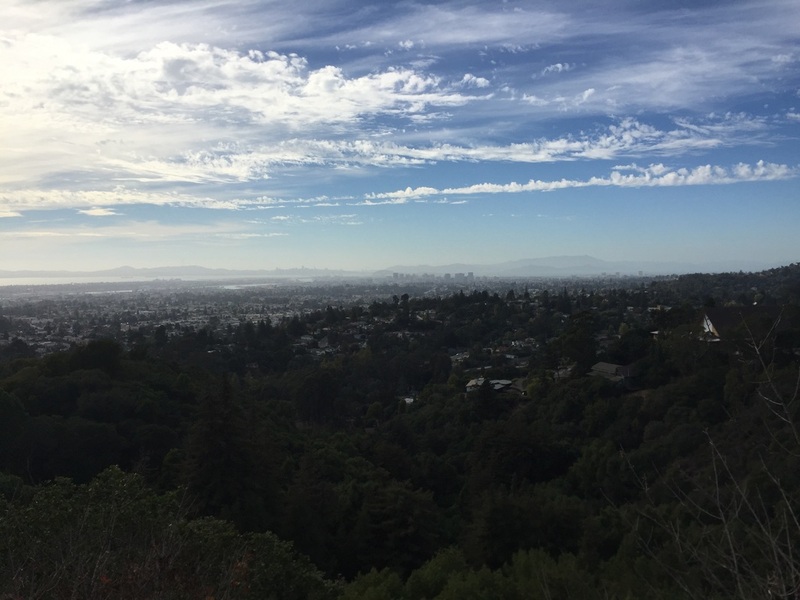 This trail snakes down via a series of switchbacks and yields panoramic views of the bay area. You'll pass a few downed trees, an old cattle cage and a water tower. 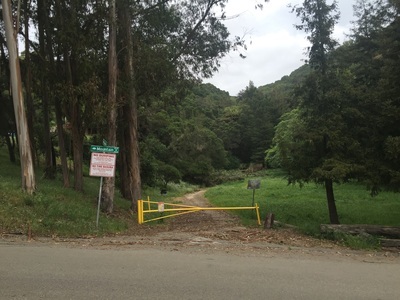 The trail ends at a white fire gate at the top of McDonell Ave. 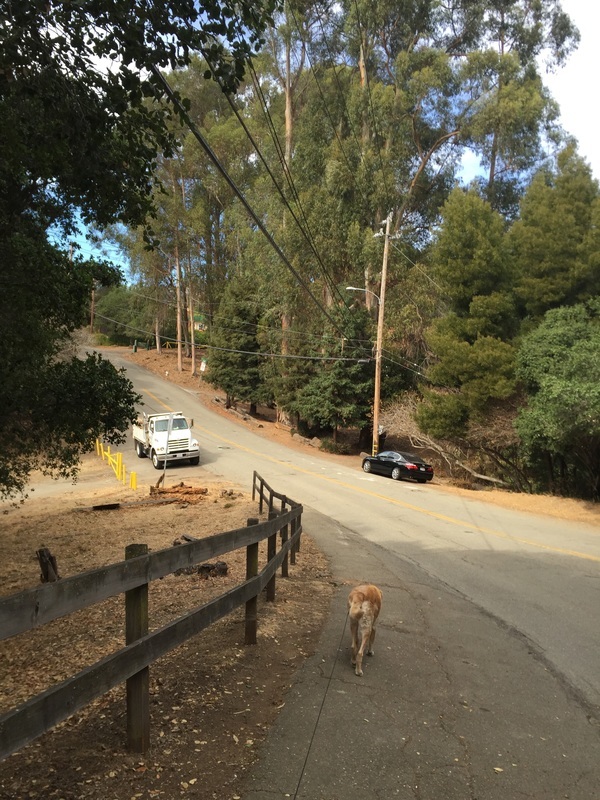 Follow this road down to Mountain Blvd, make a right, and it will take you back to where you parked on Mountain Blvd in 2 blocks. The first mile or so of this hike is great for a hot day, because it's entirely shaded, but I would recommend turning back before the shade disappears if it's a very hot day. Although the wide, dirt fire trail on the way down has intermittent shade, it can get hot under your dog's paws.